Paul Briggs can turn a ton of wood into community theatre gold. One of his sets even went on tour recently. When Paul designed and built this big, beautiful English country house for Noises Off at Guelph Little Theatre, he had no idea it would lead to spinoffs. 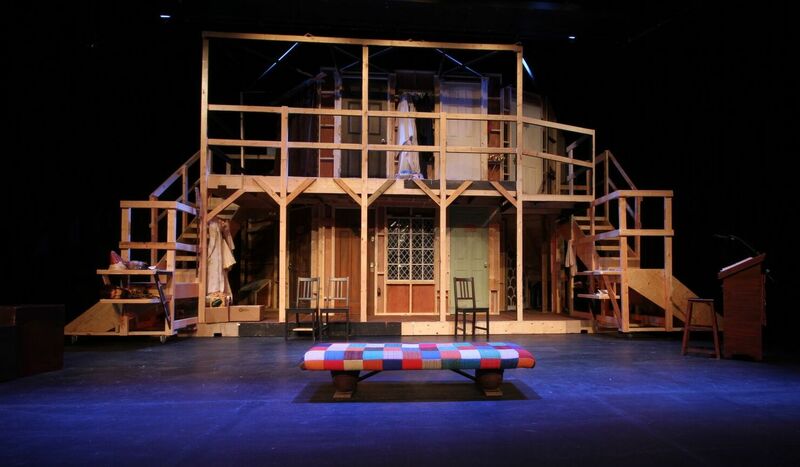 The original set design (front) for ‘Noises Off’ at Guelph Little Theatre, April 2015. In less than a year, his set has appeared in five different shows throughout Guelph and beyond. And the requests are still coming in. 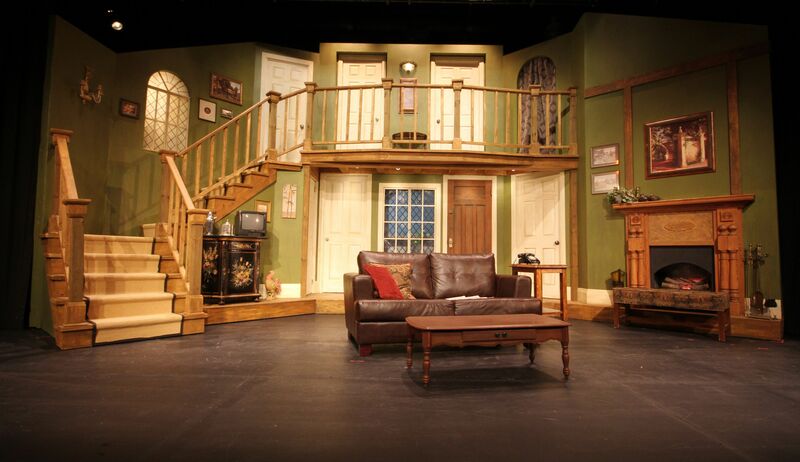 Noises Off is a busy farce that calls for a two-storey design with seven practical doors, three staircases, two balconies, a trick window, and a fireplace. But wait. The massive set also needs to spin around in a full circle, with an equally complex playing area on the other side. The flip-side (back) of the original ‘Noises Off’ set. By the time it was on the boards, the set weighed in at over 1,200 kilos. And it could be easily revolved by a single stagehand, thanks to a central pivot and 35 hidden wheels. Just days after the set strike in Guelph, all the pieces were on the road to their next gig. Paul transferred Noises Off to Assumption College in Brantford, where students performed the show in June. By September, the original set had been reimagined as the stern of an 18th century warship for HMS Pinafore. Paul tweaked his design, removed the doors and added a fourth staircase. This time out, his design did double duty. Pinafore was a co-production of Guelph Little Theatre and Royal City Musical Productions Inc., bringing two local theatre communities on deck together for the first time. ‘HMS Pinafore’ set in September 2015. A broken utility pole donated by Guelph Hydro served as the ship’s mast. In December, the now-famous set earned another high-school credit. This time, it performed as a lavish Austrian mansion in The Sound of Music at Guelph CVI. Paul’s design concept has gone the distance for several local theatre projects. And a fair rental fee brings in some extra revenue for his home group. So, everybody wins. And the tour continues. 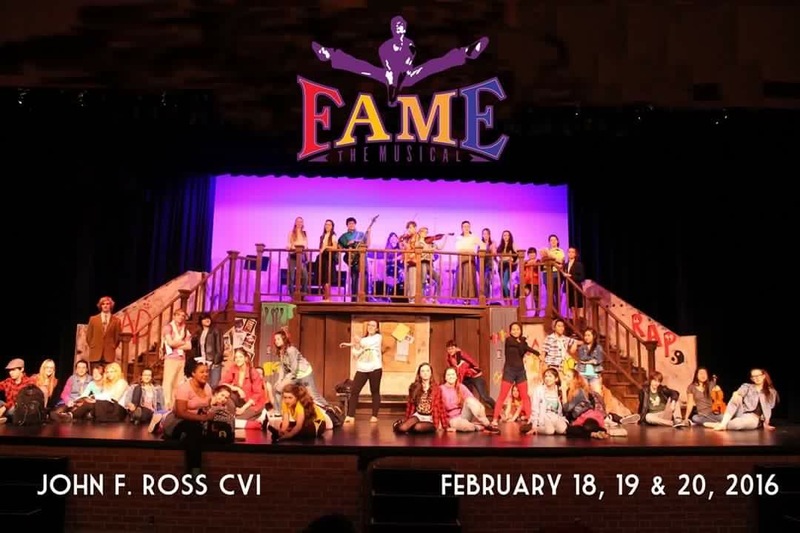 Most recently, the set made a comeback as the performing arts school for Fame The Musical at John F. Ross CVI. For nearly a year now, Paul has been sharing his clever, multi-functional set design. And he has given much more than his artistic talents along the way. Like a true community theatre artist, he rolled up his master-carpenter sleeves. Paul volunteered countless hours to rework, relocate, and rebuild the set for each of its incarnations. Paul Briggs is one set designer who knows how to ‘pay it forward’ in his theatre community. For his next design challenge, Paul is putting his personal spin on another rotating set for Shirley Valentine in April 2016. His new creation will feature an English kitchen that turns into a Greek taverna for the second Act. Ah, the magic of theatre. It can make your head spin. This is fascinating. It’s always interesting to see the workings behind the stage, and the ingenuity needed to pull something like this off. Hats off to Paul for his work. Thanks Matt. He’s a very clever guy. Worked at Soulpepper, Stratford and National Ballet — always had huge respect for the set designers and builders. Nice post!